GameStop shares fell as much as 5.7% Monday after it was reported that Apple is exploring a subscription video-game business. The service would function like a “Netflix for games, allowing users who pay a subscription fee to access a bundled list of titles,” according to a report from Cheddar. Watch GameStop trade live here. 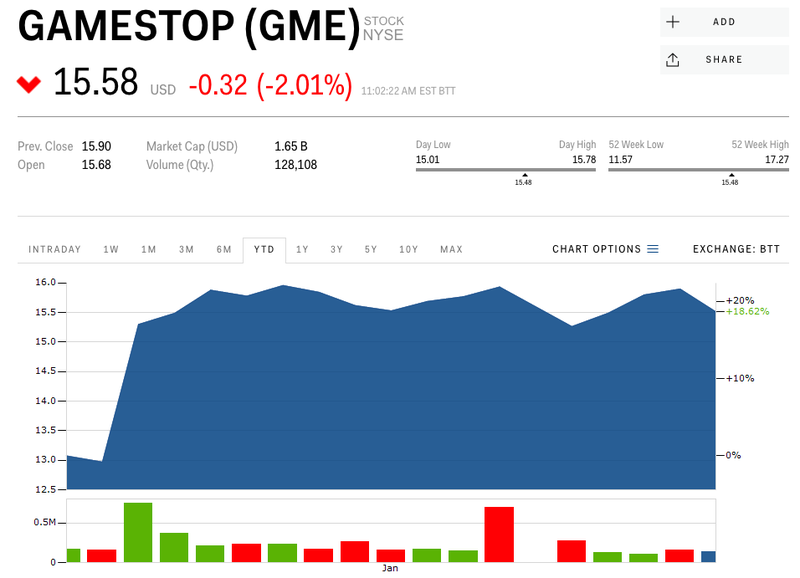 Video-game and electronics retailer GameStop fell as much as 5.7% Monday after it was reported that Apple was exploring a video-game subscription service. Shares hit a session low of $14.99 immediately following the report before recouping their losses. The service would function like a “Netflix for games, allowing users who pay a subscription fee to access a bundled list of titles,” according to a report from Cheddar, which cited five people familiar with the matter. According to the five people, who all requested anonymity, the unannounced plans are in the “early stages of development” and could ultimately still be abandoned, Cheddar’s Alex Heath said. Apple reportedly began privately discussing a subscription service with game developers in the second half of 2018. It was unclear how much the subscription would cost, or what kind of games would be offered, according to Cheddar. GameStop shares soared late last year after the company said it would sell its AT&T Wireless stores for $700 million, but they still lost 31% for the year. They have gained 23% so far in 2019, and were trading lower by 2% on Monday. The video-game retailer is set to report its fourth-quarter results on March 27.